The chunky Xbox controller returns via a tasty Amazon deal. Ah, early 2000s gaming; where everything was all pointy and bulky and, like, totally full of attitude. The original Xbox controller was the poster child for this school of design, and you can relive those glory days through an Amazon deal that gets you the officially licensed Hyperkin Duke wired controller for $49.99. That’s $20 less than its retail price. As you’d expect, it’s compatible with Windows PCs and Xbox One. 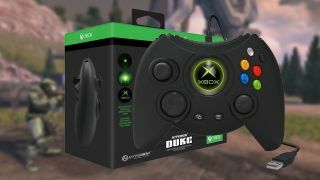 Faithfully recreating the Xbox’s hefty chonk of a controller, Hyperkin’s Duke resurrects it almost exactly as it was. There are only a few differences, in fact; Options and View replace start and select, while the Black and White face buttons are RB and LB respectively (that said, it does also have shoulder bumpers). Finally, a 9ft cable and 3.5mm headset jack round up its suite of features. Well, almost—see that central button? It’s actually a screen that plays the classic Xbox startup. This is a very cool addition that adds a cherry on the cake of nostalgia. For more suggestions on gaming handsets, see our guide to the best PC controllers.